We all know about LipSense, but why is no one talking about these? 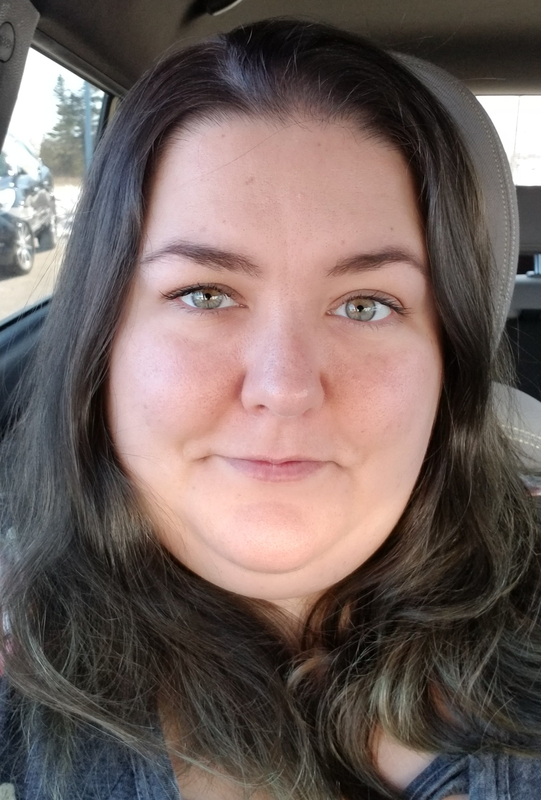 A month or so ago I was contacted by a lovely SeneGence distributor (hi Jewel!) to see if I’d like to try ShadowSense. To be honest, I was insanely excited; not only would I get to try something I’d been on the fence about, but it was also the first time I’d been contacted specifically to review a product on this platform. I definitely did a little dance when I got her email. 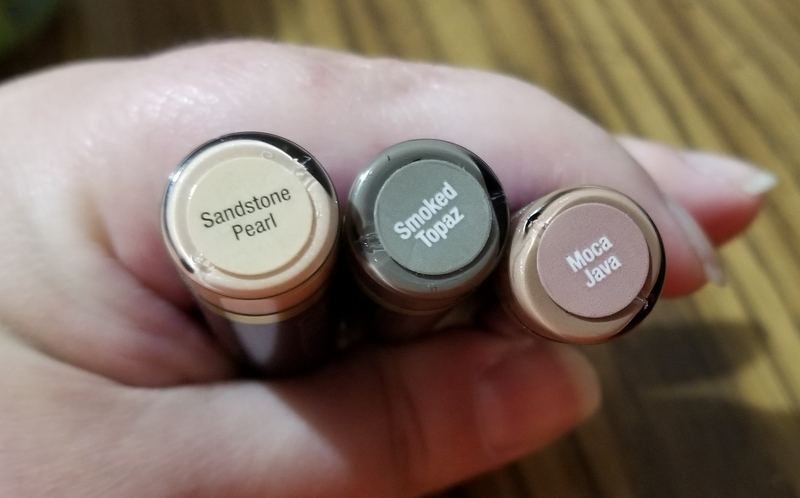 I received three matte shadows; Sandstone Pearl, Moca Java and Smoked Topaz. The shipping time was surprisingly fast, and they were packed in a cute mesh bag inside some cute paper. I completely forgot to take a photo because I was too excited and impatient to get the package open, so you’ll have to trust me that it was adorable. 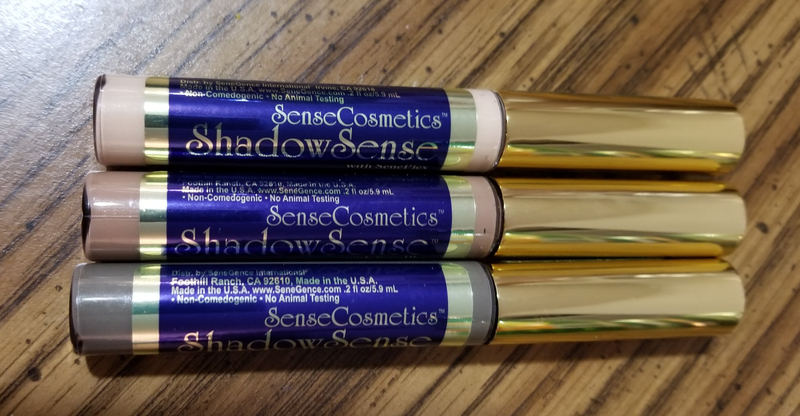 In addition to the shadows, Jewel included a catalog with all of the other SeneGence products and a sheet with tips and suggestions for how to use ShadowSense. I found that especially helpful; I like having a place to start with new stuff. I ended up deviating from some of the suggestions just because of personal preference, but it was nice knowing what works for her. I really like the colors she sent. They’re awesome for every day, and on days when I just want a subtle hint of color or a “no makeup” look, I’ve been reaching for these. They can be built up to complete opacity but I’ve been digging the sheer look. 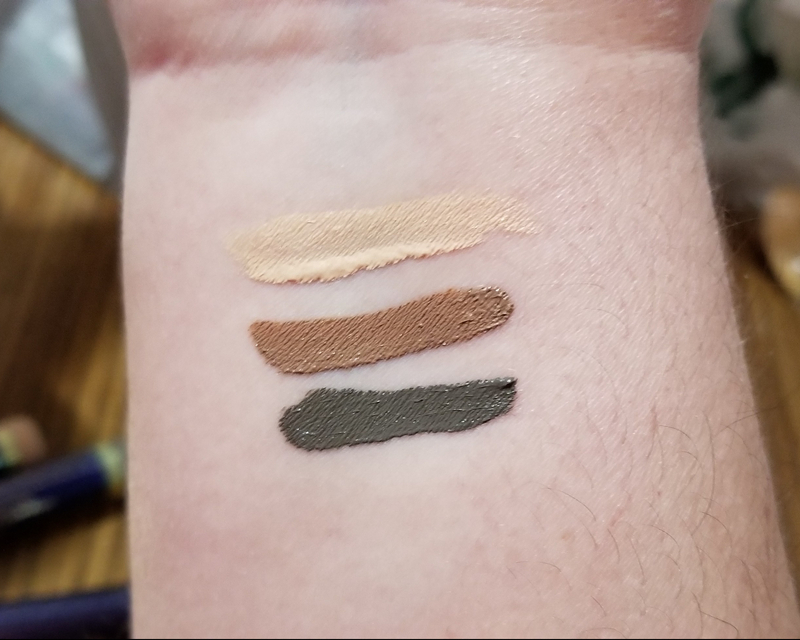 Sandstone Pearl is a light cream shade that’s very close to my skin tone; Moca Java is a nice medium brown; Smoked Topaz is a dark gray-green. Jewel suggested that I use Sandstone Pearl as a primer, and I tried that a few times but it didn’t work for me. I have oily skin, lids included, so if I don’t use a separate primer these crease within a few hours. I also prefer to blend them out with my fingers rather than with a brush; I don’t like using a brush with any cream shadows because I’m fundamentally lazy and don’t like cleaning my brushes. I also feel like I tug on my lids more when I use a brush, and I’m in my mid-30s so that’s bad. Today I used all three colors: Sandstone Pearl all over the eye to cancel out any redness or veins, Moca Java in the crease and a little bit of Smoked Topaz on the lid. I wore this for almost 10 hours today, and it still looked good. We were just running errands, but I was sweating and my eyes were watering like crazy after spending an hour in a dusty antique shop. Also, I’m wearing Urban Decay Troublemaker mascara, in case you were wondering. I’ll talk about that at some point. Pros: A little bit of this goes a loooong way so I won’t run out anytime soon. It looks good with minimal effort. It sets really quickly, which is a pro because I have hooded lids and it’ll smear; it’s also a con because I don’t like to work fast when it comes to eyeshadow. It doesn’t move when I inevitably rub my eyes. It doesn’t crease or fade, but it still comes off easily at the end of the day. The tubes are small and light so they’re awesome for travel. I’d much rather take a few of these on vacation than an entire palette. Cons: I’m not crazy about doe foot applicators on cream shadows. I think they hold too much product and half the time I don’t pay attention and product gets places I don’t want it to. For me the price is also a con; each shadow is $22. That means that the three I received were the same price as the Huda Beauty Desert Dusk palette, among other high-end palettes that I haven’t purchased because of the price. I can see how this wouldn’t be a big deal to someone who doesn’t feel the need to have every color of eyeshadow in existence in multiple finishes, but I do. I like variety a little too much when it comes to my makeup. Overall, I really like these and I might even pick up another color to round out my set. They’re going to live with my travel makeup for all of the trips I have planned this summer. I’m also interested in some of their skincare, which I didn’t even know they had. Thanks again for giving me the opportunity to try these and learn about some new products Jewel! 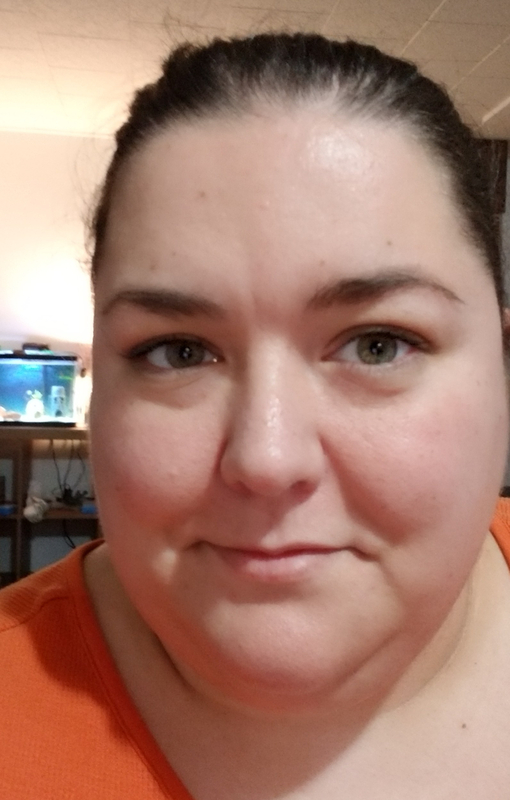 If you’re interested in more information about SeneGence products you can contact Jewel Johnson through her email or check out her Facebook group.